Winemaker’s Notes: Light yellow in color. Combining richness with elegance and vibrancy this ripe, delicious wine serves up tasty white pear, mineral notes, and toasty hazelnut. Deeply concentrated with a silky texture and layers of pears and ripe figs and mineral flavors with a long and vibrant finish. Pair with fish and shellfish in butter, cheese, or cream sauces; white meats such as rabbit, turkey, pork, or game birds; light dishes based on legumes or grains; mild curries based on coconut milk; ravioli, lasagna, and polenta with white sauce. My Review: Let me just get this out of the way – THIS CHARDONNAY IS OAKED. 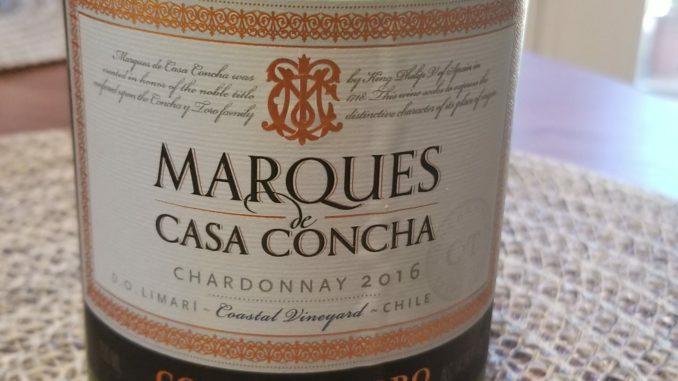 If you, like my wife, are uninterested in oaked Chardonnay, go ahead and leave (this page, not the site – I have lots of other reviews for you to read). Ok. Let’s talk about this wine. In the glass it was a golden straw yellow color. On the nose I picked up vanilla, apple, and some spices. In the mouth the wine showed pear and pineapple notes with a round, toasted finish that really showed off the oak. It wasn’t overly oaked, but it was certainly more than my wife prefers, and more than a lot of other people I know that aren’t completely turned off by oak prefer. I didn’t initially pair the wine with food, opening it up over the weekend to “Netflix and Chill” as the kids say these days. That means I stretched out on my couch with my dog and watched the new Voltron series on Netflix (child of the 80s here!). We did eventually cook dinner, and the grilled chicken with the wine was a nice pairing, helping to balance out the oak with the seasoning on the chicken. For $22 it’s probably a bit pricier than a lot of the oaked Chardonnay that you’re taking to cookouts this summer, but to be fair, it also has a bit more nuance than most of those – this may not be my preference in this weather (I prefer crisp whites and rose’s), but as far as oaked Chardonnay goes, you can do a lot worse. I should know…I have.